This column kicks of a small series at www.nextgenerationinfrastructures.eu on Transatlantic infrastructure observations by a scholar working on Transatlantic Tourism. Frank Schipper is currently fellow in economic and social history at the German Historical Institute in Washington D.C. I am a prophet on two wheels, spreading the gospel of new mobility and healthy living. I must have looked puzzled, staring helplessly at the instructions explaining how to sign up to Vélib, Paris’s new biking scheme. Two passersby, probably a couple, were kind enough to come to my rescue. Before I knew it, I held a code in my hands that would provide all the movement I needed for the upcoming week. At only 8 euros (or 1,70 a day), Vélib easily beats Paris’s well-branched public transportation system in price. In addition, I soon discovered, Vélib would show me a Paris I had never seen before. Like most tourists, I have used the Metro extensively on previous visits. The system conveniently links the manifold highlights underground and is reasonably fast. By bike, however, the City of Light displayed a gem that remains hidden for the subterranean traveler: its sight lines. I found myself cycling from one monument to another. This concerned not only the well-known iconic ones like the Arc de Triomphe or the Opéra: many minor monuments mushroomed along my route and I cleverly shifted my routes from the archive to my apartment daily, receiving just as many different vistas in return. I have now moved temporarily to Washington D.C. and, guess what? 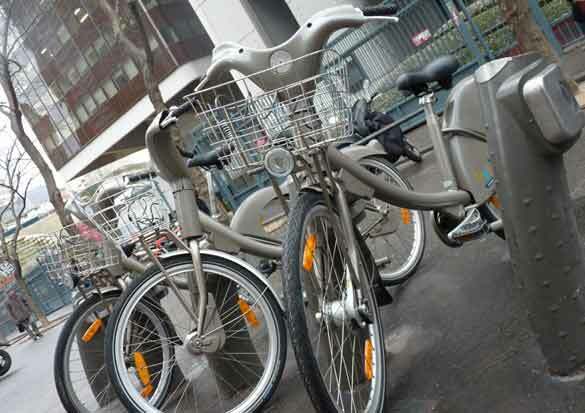 The American capital too has introduced a bike-sharing scheme based on the technology used for Bixi in Montréal, Canada. Capital Bikeshare has introduced 1,100 bikes that now populate Washington’s streets. The scheme celebrated its first anniversary on September 22nd. Though the scheme certainly pales numerically when compared to its counterparts in London (6,000 bikes) and especially Paris (20,000), and despite the very limited number of cycling paths accompanying the scheme, the introduction of Capital Bikeshare is arguably more revolutionary on the western end of the Atlantic. Although the ‘bicycle craze’ has been at least as massive on either side (it’s easy to forget that 80% of movements in e.g. Amsterdam in the 1930s was made by bike), the American 20th century has made automobility one of its defining characteristics. Still, by sheer coincidence, and beyond anyone’s expectations, Capital Bikeshare accomplished its 1,000,000th ride on its anniversary. In the Netherlands using my bike is an inconspicuous normality. Cycling in Washington has a dramatically different touch to it. With every step on the pedals I feel I make a difference. I show the large majority of motorists that the bike can be a real alternative to their gas-guzzling vehicles. My presence trains other road users to stay alert and respect the bikes. I sense I am part of an avant-garde that is transforming Washington, making it more sustainable and livable. If this endeavor delivers good results in a place that has embraced the car like no place else, the gospel of the bike may find fertile ground virtually anywhere. I am its apostle, spreading it in word and deed.